If you like wine and you’ve never been to Hopland, California, you might want to check out the beautiful countryside with it’s rolling hills, mountains and rivers that sculpt, paint, and texturize the views that surround you. On an amazing road trip that we took this spring, we stopped at Saracina Ranch because of the “Trees of fire”- at least that’s what we called them. From the highway, out of the corner of my eye, I could see what seemed to be trees on fire but it was just the brilliant colors of the branches of willow trees. I’ve learned that in fall when the tree drops its leaves the bare branches turn an illuminated color of orange that looks like fire… it is truly captivating. So we had to stop and look. Next to a stunning grove of majestic 300+ year old olive trees is a very inviting tasting room. And just to the right of the tasting room, carved into the hillside with two giant wooden doors, is the entrance is their Wine Cave hummmmm… very interesting. Oh yeah before I forget just beyond the cave there are the “Trees of Fire” willows that had grabbed our attention from the highway. This ranch is a photographers dream, and from what I hear it’s also a wine tasters dream too! Besides working, we do go out and play. We attended opening night at the North Coast Brewery’s “Jazz Club”in Fort Bragg, California. There opening band was Bruce Forman and Cow Bop. What a performance! These guys are warm, inviting, funny, entertaining and amazingly talented. They were like… Django Reinhardt blending with Hank Williams. If they come to your town don’t miss them. Here is a quick video I shot with my iphone… Enjoy! Looking forward to a prosperous New Year! We celebrated the first day of the new year by saying hello to our southward migrating mammal friends and just enjoying the magnificent Mendocino Coast. The daytime shot was taken from the street in front of the Ledford House Restaurant in Albion; this is the view you get from their dinning room. The sunset was taken from the headlands in the village of Mendocino. It was like somewhere over the rainbow…And it is for Sale… What a fantastically, whimsical place near the Mendocino Coast just north of Point Arena California. This 200 plus acre farm nestled in the Garcia River basin bordered with redwood forest is an amazing find with all its organic crops. Apple, pears and an assortment of different veggies. Drying rooms, chicken coops, working windmills, and an “espaliered” apple orchard (trained on trellises in rows much like grapes in vineyards). The rustic cabins are a great place to organize a retreat for people who want a peaceful, quiet getaway and weddings too. We loved this place and Boodog got to swim in the Garcia River and hang out with us. Our lastest outing was to Blackhawk in Danville CA. to film our best friend’s video on haircutting and hairdressing. What a weekend, thanks to Tribez Salon for hosting the shoot. 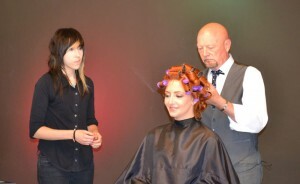 Our friend, Jeffrey Tuffin, not only dazzeled us with his expertise in hair but was also quite entertaining. The models were great and the staff was superb at assisting us and Jeffrey with the shoot.